(Newser) – Billion-year-old rocks pulled from deep below the Sahara Desert have revealed the earliest colored molecules found on Earth. They aren't black, brown, or even green. Instead, think pink. Nur Gueneli of Australian National University was examining molecules from crushed rocks discovered a decade ago by an oil company drilling into a marine shale deposit beneath Mauritania's Taoudeni Basin when she extracted a pink pigment. "I heard this screaming in the lab," then Gueneli came running with "this bright pink stuff," fellow researcher Jochen Brocks tells the Guardian. 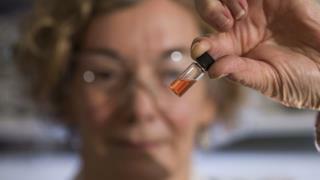 "It turned out to be real pigment, 1.1 billion years old." At least 500 million years older than other biological colors discovered, the pigment came from molecular fossils of chlorophyll, produced by tiny cyanobacteria that lived in ancient oceans, per a release. This darn expanding knowledge about bacteria is putting a large hole in Western pastoral doctrine and belief. We may have to return to canon law to save our souls. Our bodies are already going to Hell. Are there any Wise Sages out there that can answer this? Why is our past history buried on Earth? How does it get buried ? Where is the sand, soil, rock coming from that gets deposited over it, from mountains, outer space ??? Why are objects thousands of feet, or miles, below the surface? Does that mean the Earth's diameter / circumference is always increasing ?